I awoke this morning to the hum of the air conditioning and the inevitable realisation that I had packed too much stuff. Even thought I thought I bought only what was absolutely necessary, I realised I could have omitted a few extra t-shirts, a pair of trousers and maybe the odd cable to cut down my weight by a kilo or two. We got ready and found somewhere for breakfast. I wasnt surprised to see the menus full of western, mainly American, fare. We eventually found a place with wifi and ate while researching the aim the morning. 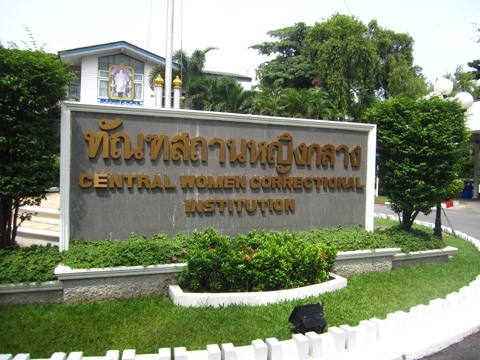 We were to go to Klong Prem Prison and visit an inmate with whom I share a mutual friend. 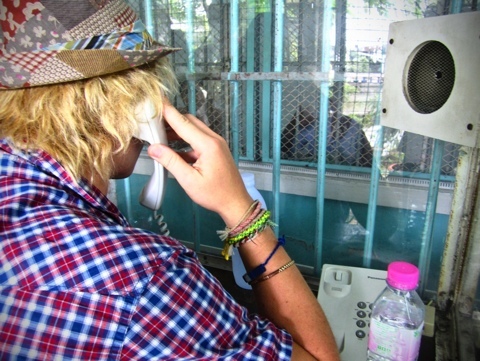 Klong Prem is home to some 20,000 inmates, a large percentage of whom are foreigners. There is a men’s section, a women’s section and a unit which houses the section which rehabilitates drug addicts. We were to meet was Octavia Malavu in the women’s section. She is a South African lady who was imprisoned 17 years ago on drug charges. My friend Eloise, also South African, had become a pen-pall of Octavia’s several years ago and stays in contact and visits when she is in Thailand. She asked if Ed and I would go and see her. Our cab dropped us at the main prison compound and after some searching and awkward conversations trying to explain where we were, we found the women’s section. It only takes a few minutes to register to see an inmate but then you wait with around 100 other people for them to call out the name of the person you are visiting. We waiting in the 35 degree heat for just over an hour before Octavia’s name is called out. We make our way to the visiting area and after leaving our bags with the guard, we find ourselves in a long corridor, filled on one side with booths. Each booth contains a stool, fixed to the ground, and a telephone. Beyond the plexiglass screen directly in front of me, there is a gap of around 1.5 metres, then another screen and beyond that, sits Octavia. She is a pretty, happy lady with a big smile and pink lipstick. She was very pleased to receive a visitor and even more pleased to hear that I had been asked to come by her ‘Baby Girl’, Eloise. We told her about our work on the ship and gave her news of her friend. Octavia was very open and willing to talk about why she was there and the conditions she lives in. She is 17 years into her sentence was very positive about the possibility of soon being released when the King gives his next amnesty. Her faith is clearly a big part of why she remains so upbeat and she teaches the bible to other people in the prison. Over the past 17 years, Octavia has undertaken many courses and training programs in beauty therapy; makeup, nails etc, but also has learned to bake. She was a hair dresser before she was put in prison and hopes to go back to doing that when she returns to south Africa and her 3 children. The conditions inside the prison are not good. 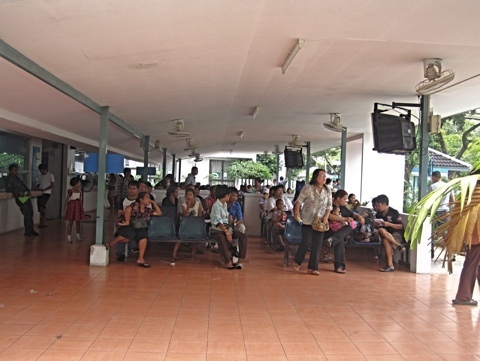 Certainly the inmates of Klong Prem are afforded many less rights and priviledges than their British counterparts. 200 people sleeping top-to-toe in a room with no air-conditioning, 10 scoops of water from a bucket constitutes a shower. During rainy season, they are often left put outside all day with no shelter and and no umbrellas incase they fight, although it is hard to imagine Octavia poses any such threat. If you do not have a coat, then you get wet. Octavia is so positive about her existence and every aspect of hef life that the way she talks about these circumstances comes off as almost casual. However, It is difficult to comprehend just what she has to go through. “Each day is a struggle,” she says at one point. They change the rules when ever they please, so one day she may find something she had been allowed to do the day before is suddenly no longer permitted. Before we left we asked if there was anything we could do for her. She asked that we bought her some food and toiletries in the shop that would later be delivered to her. She has to pay for everything; her food, her clothes, her bedding, but visitors are allowed to purchased goods on behalf of the friends and family they are visiting. We said our goodbyes, promised to pass her love onto Eloise and to write to her in the future and, after our allotted 20 minutes was complete, we exited along the corridor full of booths back out into the the court yard. It is very easy for those of us more fortunate than Octavia to be quick to pass judgement on the situation of her and others like her. Some people who are imprisoned in Klong Prem have done some terrible things but for others, it is not so clear cut. If you were faced with the choice of not being able to pay for food for your children or the opportunity to make more money than you could ever dream of by doing one ‘job’ for a so called friend, then I believe any one of us would think twice. Thank you! I know she is happy, and that it’s made her day! xox. Love the pics and remembered my tantrums i use to throw waiting in that heat sitting on those benches! Thank you for taking time to put a smile on Octy’s face. For sure your visit has changed her day and life! What a wonderful deed you did!! awesome work, you guys made Octavia’s day! It was an amazing , humbling experience. Such a lovely lady. I told friends of mine who live in Samui and they said they would try and visit too. Thanks for reading and commenting my blog but I have to say I am glad that you have not received the “world of abuse” that you expected in response to your post. I should hope that anything I write or create would become a forum for discussion or debate rather than abuse and accusation. Which is in part why I was slightly concerned with your comments they did seem rather inflammatory and also call into question mine and Octavia’s integrity. I try never to write “nonsense” but only the truth and I would say that in this case, I had a reliable source whom I trust. I was actually genuinely interested to find out how you know such accurate information, this is a subject that interests me and I plan on visiting in the future.